Fans’ insatiable appetite for news on their favorite games has created a market that Photoshop-skilled fakers are exploiting. For every verifiable leak, there are dozens of hoaxes spreading false information. Sometimes they are revealed quickly by their creators and their motivations are relatively benign. There are others who want their constructions to fool viewers, and they bask in the glory of tricking the unsuspecting. While most are easy to spot, these are the leaks that went the extra mile to try to fool us. The recently discredited “Grinch Leak” made its first appearance in a Snapchat video on October 24. It appeared to reveal artwork with the entire roster of fighters in Super Smash Bros. Ultimate. Seven characters were supposedly unveiled, including Shadow the Hedgehog, Banjo-Kazooie, and Ken from Street Fighter. The characters where just believable enough that the debate quickly split viewers into two opposing teams: those who trusted the rumor, and those who denounced it. “Team real” pointed to a promotional image of The Grinch movie in the background, which gave the rumor its name as proof of the leak’s veracity. The image seemed to corroborate the leaker worked in advertising, and so would have access to privileged information. The skeptics were ultimately victorious when, during the Nintendo Direct on November 1, Incineroar was revealed as the last unique character in the base game, with Ken from Street Fighter introduced as an echo fighter. 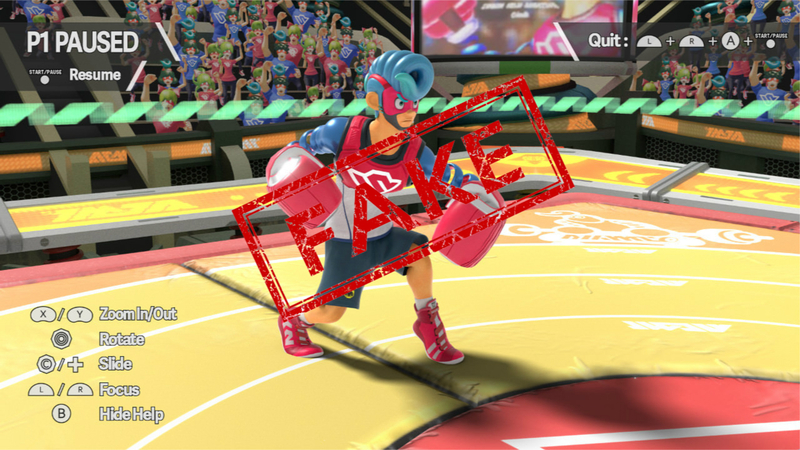 Super Smash Bros. attracts a dedicated fake leak crowd. It is a long-running series that reuses a lot of stages and characters – making it easy to get a hold of plausible artwork – and fans spend years speculating wildly about the game’s characters. Which is why an anonymous post got so much attention on 4Chan back in April. It had several screen shots and a short video that allegedly exposed unannounced characters coming to Nintendo’s fighting game. Unlike many easy-to-dismiss fakes, these pictures were presented in resolution and included mundane unconfirmed – but anticipated – elements. The leak played on people’s expectations that the Ice Climbers, who haven’t been in Smash Bros. since Brawl, might return; that this generation Mario would have Cappy from Super Mario Odyssey; and that Nintendo would introduce a character from their new IP, Arms. Even though wary fans seemed to take these images with a grain of salt, they were so well done, few were willing to confidently denounce them. E3 is like Christmas for gamers and leakers alike. The frenzy of excitement surrounding the tightly guarded presentations creates a perfect environment for leaks to go viral. This year, it was especially easy to pass off fake information due to the unusually high number of real leaks. For instance, Walmart Canada’s online store accidentally went live too soon and, though it was hurriedly taken down, screenshots made the rounds. Though it was riddled with questionable content, the online inventory nonetheless garnered intense attention because it appeared to show games from almost every major E3 presenter. When, in the aftermath, Bethesda hurriedly announced Rage 2 – one of the most out of the blue games on Walmart’s list – they inadvertently confirmed legitimacy on the entire leak. Taking advantage of the hectic atmosphere, a list popped up that purported to detail Nintendo’s full presentation and Treehouse schedule. The list went viral and got plastered in every corner of the internet. It promised gameplay footage of several anticipated titles like the new Metroid and the rumored Star Fox racing game. The schedule, however, didn’t stand up to scrutiny. The formatting was inconsistent throughout the document, some of the game titles – like Yoshi’s Flipping Island – were too bizarre, even for Nintendo, and the page was peppered with typos. But again, because the Walmart list had many of the same problems, this leak couldn’t be entirely debunked until after Nintendo’s E3 video presentation. At the same time the fake Nintendo itinerary was making the rounds, several people wanted us to believe they had gotten their hands on the Sony conference schedule. 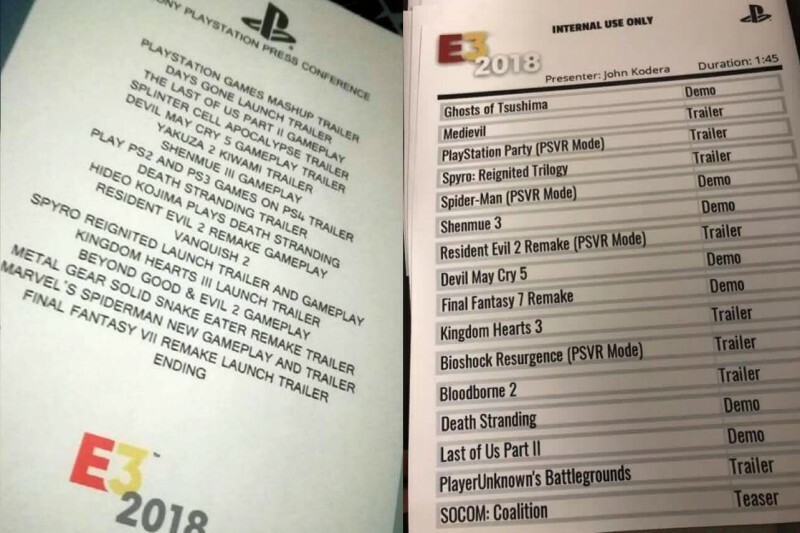 It is surprising how many people believed the information despite there being two dissimilar Sony documents, but the E3 hype was at a crescendo. Like many other rumors on this list, these leaks were able to gain momentum because they played on fans’ wishes and built a valid foundation with already confirmed information. The documents promised long desired announcements from PS4 backward compatibility to Bloodborne 2. Sony quashed the rumors quickly when they broke from tradition and openly announced they would only be focusing on four Sony exclusives during the conference: Death Stranding, The Last of Us: Part II, Ghost of Tsushima, and Spider-Man. Fans have been desperately waiting for a new Animal Crossing, so leaks regarding the game were popular this year. 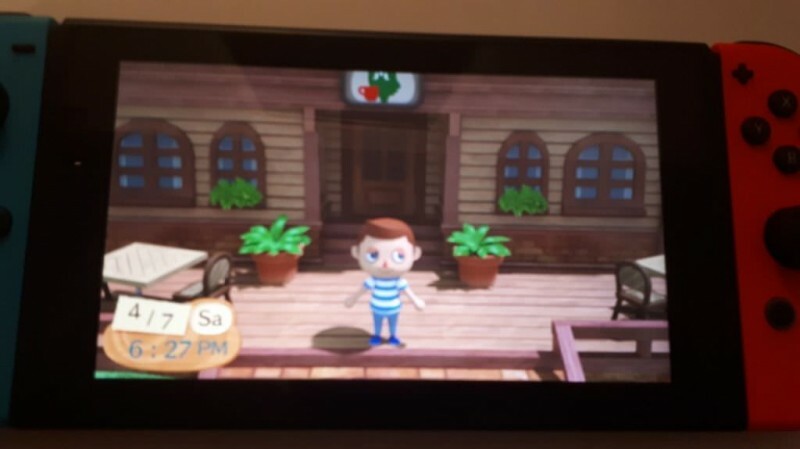 Once again, the hoax debuted on 4Chan and it showed a title screen of Animal Crossing: Globetrotter alongside a second image of a character. This leak and others like it prompted an unusual PSA from Tristan Cooper, editing manager at Dorkly. He presented his own fake leak that began believably, and then over a series of screenshot unmasked itself as a Photoshopped fiction. He made it as a humorous warning urging people not believe unverified internet leaks. One fake screenshot even points out that an earlier picture had inserted pictures of Shrek in the background. The responses to his piece demonstrate how easily some had been fooled. While some appreciated the joke, others vehemently resented being tricked. A post on reddit from ShineRise1 back in March claimed that, after six years of waiting, the next Borderlands was coming out within the year. A slew of speculation followed in the announcement’s wake. True to form for a fake leak, the camera work and resolution left a lot to be desired. A shaky video of planets ended in a single screenshot that showcased a completely made-up logo and protagonist standing in the rain. In the post, ShineRise1 describes the game’s progression from linear to open world gameplay and also indicated the game had a September release date. 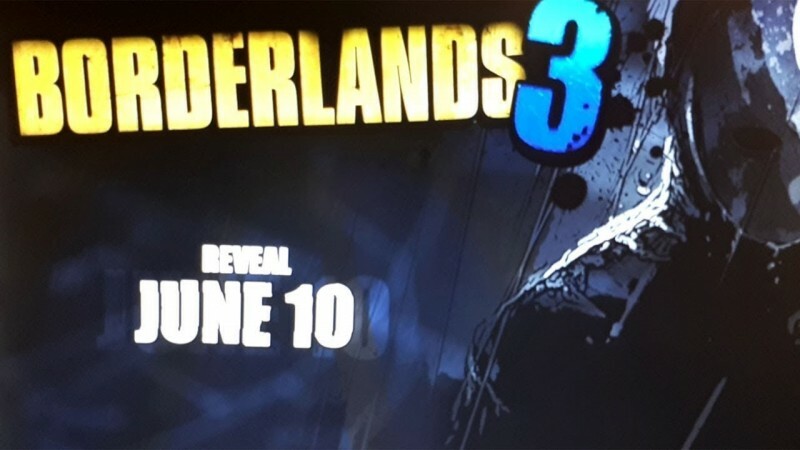 It wasn’t a secret that Borderlands 3 was in development at the time, a developer’s recent Twitter post that he was working on the “next Borderlands” supported the leak’s plausibility. The hoax unraveled when someone superimposed the image of the “new protagonist” on top of an image of a character in a Dark Soul II’s trailer. The mask and rain in the background matched exactly, proving that the leaker had simply cropped an image. When a much-loved franchise is left alone for too long, fans begin to get antsy and leakers smell opportunity. 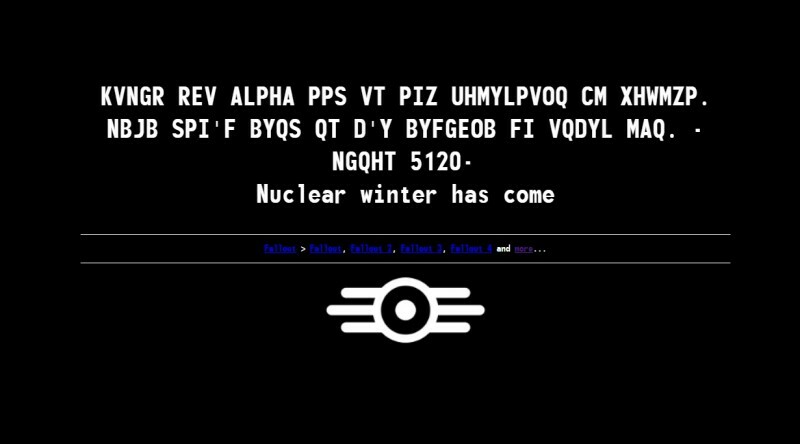 This was the case back in 2013 when an enigmatic website with the URL thesurvivor2299.com, seemed to promise the official reveal of Fallout 4. This leaker went all-out in the attempt, as he later explained, to force Bethesda into sharing real details about their plans for the game. The website hosted a countdown clock that ended on December 11, the same day as the VGX awards, which could have made a great venue for a big announcement. That ZeniMax Media, Bethesda’s parent company, owned the domain, added fuel to the fire. The site had secret messages that referenced game characters, it had cryptic codes that sent fans on wild goose chases – it even featured some Morse code for good measure. To everyone’s chagrin, the hoaxer came clean and Fallout 4 wouldn’t come out for another 2 years. In January, a video emerged claiming to demonstrate firmware update 5.0 for the Nintendo Switch. 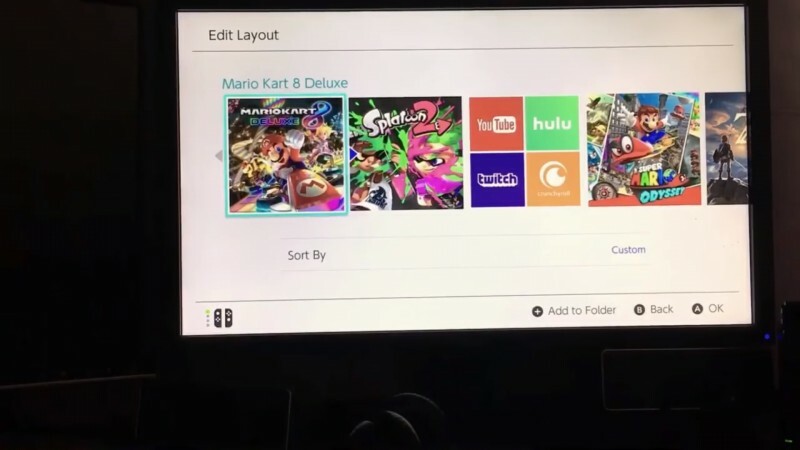 The video presented a YouTube app coming to the Switch which excited many people because fans’ have been asking for YouTube on their Switch since the console launched. A few short days later, the leaker proudly took credit for his handiwork with a brief apology and a hope that Nintendo would take notice. The power of this leak is that, even after being revealed as a hoax, everyone still wanted it to be true. Many outlets covering the story touched on this sentiment and suggested that Nintendo might be wise to consider the fan reaction. It may have taken the better half of a year, but Nintendo did introduce the long-awaited YouTube app earlier this month. Many of the leaks on this list pretend their fake information came from an official source to seem more legitimate. Back in the end of May, that’s just what happened when Game Informer got dragged into a hoax. 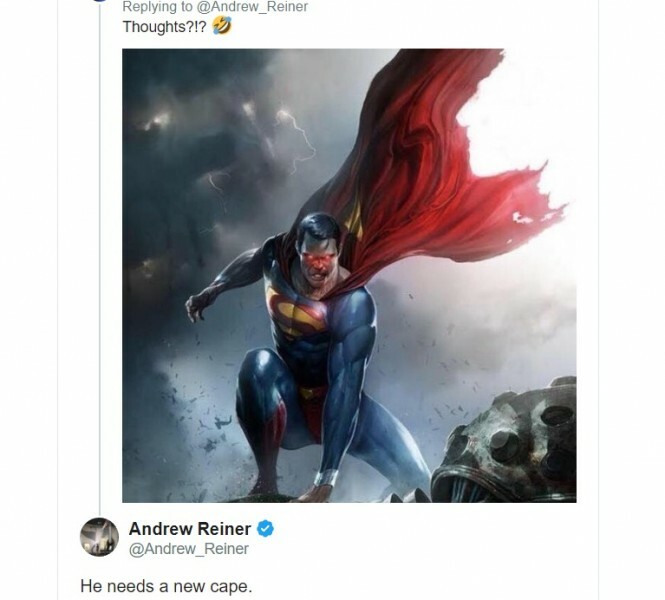 A 4Chan poster falsely insisted that they had early access to our cover, which would break the news of Rocksteady’s upcoming Superman title. The claim wasn’t outrageous, because Rocksteady was already closely tied to the superhero genre. The studio made the Batman: Arkham games into one of the most successful superhero video game franchises of all time. Though the claim might have seemed plausible at face value, anyone would have been able to see that almost the exact same debunked story made the rounds back in November 2017. The whispers became more frenzied after Twitter post from Andrew Reiner didn’t deny the rumor. Game informer’s real July cover released soon after – with Anthem on the on the cover rather than the man of steel – and the jig was up. Nothing gets fans’ imaginations going like the announcement of a new game system followed by years of silence. Back when the Nintendo Switch was still cloaked under working title project NX, people couldn’t keep from speculating about the impending Nintendo console. Enter the two-part hoax of the NX controller. Multiple pictures from different leakers surfaced of an unusual looking controller with two joysticks on opposing ends of an elongated disk that seemed to replicate an earlier hardware patent. One poster, Idriss2Dev on Reddit, even showed the supposed controller alongside a sticky note that referenced a quote from the Wii’s reveal. The internet tore the images apart looking for clues and under the pressure, David Louis-Marie revealed his hoax that he put together with a 3D printer and Photoshop. Soon after, the second poster, Frank Sandqvist, stepped forward and explained his motivation for carrying on the hoax. He was interested to see how easily he could recreate the leak just for laughs but then regretted getting peoples' hopes up. This is the example par excellence of a fake leak that had everyone going. 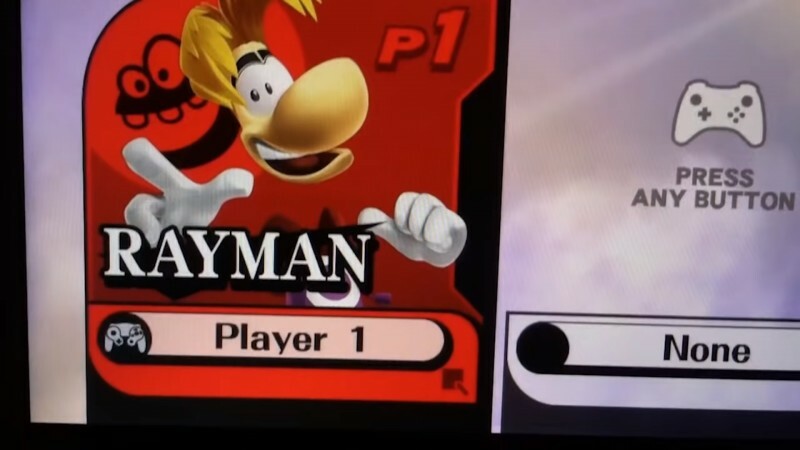 The video showed a Super Smash Bros. menu depicting Rayman as one of the fighters. The internet went crazy with the footage, and Omni Jacala came forward himself after only a few days. We spoke with him back when the story first broke to understand what motivated him and other leakers to do what they did. In an interview with Kyle Hilliard, Omni explained that he was just a fan that wanted to display his artistic skills and love of the game. He said that he didn’t mean any harm and didn’t really think of the consequences. He created a video educating people on how he made the fake, and he now uses his YouTube Channel to analyze other questionable leak videos, many of which have appeared on this list. As technology gets better, fake leaks will become harder to spot. So, no matter how much you want to believe that screenshot of your favorite character in Super Smash Bros. or that footage claiming the game you've been waiting for forever is just around the corner, take every leak with a grain of salt. Or don't. We can make another list next year.